Flormar makeup glitter eyeliner highlights and defines your eyes with dazzling and shimmering pearls and glitters. It’s texture is liquid and it comes with a mini applicator like all glitter eyeliners. Flormar’s glitter eyeliner comes in eight colors. I will be writing a review on shade number 304. Sadly their products don’t have names but this is a blue eyeliner with silver glitter. I would say it’s perfect for all eye colors. You get 5,5 ml or 0.18 oz. of Flormar makeup eyeliner. Flormar makeup review today is about this glitter eyeliner. I have used a glitter eyeliner from NYX and Essence. I haven’t written reviews about them but I will shortly compared them here. This glitter eyeliner is similar to most glitter eyeliners, when talking about drug store products. I liked that the glitter eyeliner sticks to the eyes really well when dry. The eyeliner is quit sheer what suits me the amount of glitter is just right. Flormar’s glitter eyeliner brush is of good length and size. The packaging is small and practical. It can be carried in a smaller purse without any problems. The glitter eyeliner, like all glitter products should not be used inside the eye or on the waterline. When comparing it to NYX and Essence, I would say it’s better quality, much thicker and less sheer than NYX glitter eyeliner . When comparing it to Essence it’s more sheer but has a bit more glitter than Essence. Flormar’s glitter eyeliner is right in the middle. 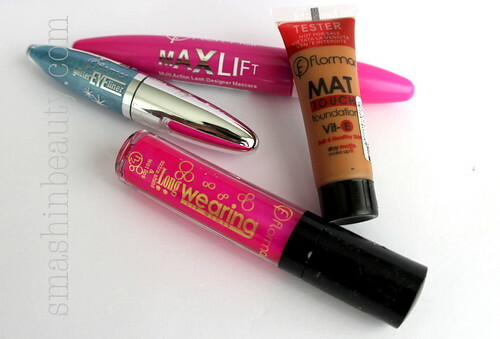 Flormar glitter eyeliner you might not like it if you like thick or intense glitter eyeliners. This is a sheer eyeliner. The texture is liquid so when you layer layers it takes some to dry. The glitter eyeliner from Flormar must be layered in order to get noticed. It really is sheer. I think it’s perfect for day makeup. My brush has a bristle that was popping out what caused problems with application. The brush in Flormar’s glitter eyeliner could have been a bit thinner in my opinion, it’s a bit thick. A few beauty tips and tricks that I would recommend would be that when applying this glitter eyeliner layer it one layer at a time. Let it dry and then apply another layer. To get the most out of Flormar’s glitter eyeliner, apply it over an eyeshadow or another similar color eyeliner. I think that this glitter eyeliner is perfect for day wear makeup. Beauty tip, apply a blue eyeshadow or eyeliner and Flormar’s glitter eyeliner over it to get the most out of the eyeliner. Flormar makeup glitter eyeliner tj. šljokasti tuš za oči kojeg ja imam je nijansa 304. Taj nijansa je plava i ima male i sitne sive šljokice. Dobijete 5,5ml u malo praktičnoj bočići. Ovaj šljokasti tuš za oči je lagan (sheer) tj. prozirniji je i sporije se suši. Iako imam šljokice, one nisu preočite, ja bih rekla taman količina. Možete dobiti intenziviju boju ako nanesete ga u više sloja ili preko nekog sjenila. Flormar glitter eyeliner četkica je dosta duga i gusta, no osobno bih voljela da je kraća i tanja, zbog preciznost. Ovaj tuš za oči je bolji od NYX šljokastog tuša za oči, no prozirniji je od Essenceovog šljokastog tuša za oči. Ja bih rekla da je ovo savršen šljokasti tuš za oči za dnevnu šminku. Ukratko ako volite prozirniji šljokasti tuš za oči onda Flormar glitter eyeliner je za Vas. * PR product given by Flormar for sampling and reviewing purposes.